Zambrów also had to participate in the celebration, when Nicholas II ascended the throne, just as all other cities and towns of the Russian Empire. Naturally, most of the ceremonies took place in the barracks, but also in the city, it was a week full of celebrations. First, all the houses in the city had to hang out new Russian flags. Beside the white Beth Hamidrash, a gate was erected, fashioned from colored flowers, and at night, they were illuminated by colored lanterns of red, blue and white – the colors of the Russian national flag. the same was done on the balconies of the new Jewish houses on the marketplace. Poles got drunk, soldiers drank, and the Jews offered ‘Mi SheBerakh’ blessings in the various houses of study, and sang [the national anthem] ‘God Protect the Czar,’ [for] the new king, Nicholas II. And Nicholas immediately repaid them with taking away the taverns from the Jews, and replacing them with [state-run] monopolies. Perhaps, it was necessary to stop drunkards from drinking, but many Jews lost their livelihood. 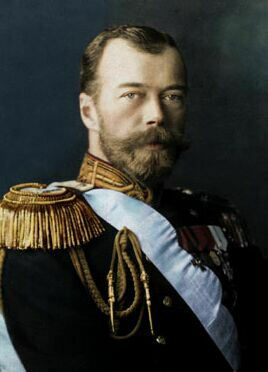 photo: Czar Nicholas II of Russia. From Wikipedia. Nothing else newsworthy happened in Zambrów in those years. Poland was already on the way to becoming industrialized. This had the greatest effect on the large, landed estates of the nobility, and this brought tens of thousands of the rural element into the cities, to compete with the urban people. And this, in turn, drove thousands of people out of the cities, mostly Jews, causing them to emigrate to other countries, to America. Zambrów was no exception. One would travel to earn and save a few hundred dollars, and then come back. People would even return to serve in the military, because no one wanted to be cut off from their birthplace. In the later years, when the anti-Semitism had worked its way into the fabric of the economy of the land, emigration to America became permanent – to never again look upon Russia. The beginning of the twentieth century heralded the coming of great change, because the masses of two of the largest countries, on two continents, had harbored revolutionary ideas for years: to topple their monarchial governments and to establish a constitutional government. These were Russia and China. The opportunity to do so came quickly, when the Czarist government sought to weaken the revolution, by dragging Russia into a war with Japan. This had exactly the opposite effect – because the Russian masses did not want wars, and this led to severe defeats on the battlefields of Manchuria and forced the Czar to issue a Manifesto, introducing a constitutional monarchy in the Duma.